A trench coat is a great must have in your closet, especially a great bridge between summer and autumn. I know that it is just August and way too far to think of Autumn, but British weather just makes me to consider this far already. Return of chilled days, comes trends of various coats and jacket. From a feminine silhouette to a loose trench coats, it is a fashion ultimate must have for autumn closet. If you say a trench coat, first things that come up to your mind would be a water resisting piece of stylish outfit or the traditional first trench coats by Burberry. Did you even know that trench coats was back then made to be used for soldiers during World War II? The trench coat originally was meant for military activities and thus it was designed for comfort and functionality. After the war Burberry and many other design brands, for instance Jack Wills, started to leverage the piece of outfit to another level. Nowadays, we can see and find variety of women's trench coat. Different lengths, hems or shades. That is why trench coat is so easily to be worn and suitable for different styles. So, in order to create a stunning look with trench coat, choosing the right coat is an important starting point. As they exist in different lengths and shades, be careful in choosing the right one that will go right with your body shape and skin tone. Trench coats might be classical, timeless apparel, but there's something so effortlessly chic about it. And now let me share you 5 ways on how to style a trench coat. 1.Leave a gap when tying your trench coat, to show off your outfit details beneath. If you are wearing a great outfit that you would like to show off, either do not button up or belt it in front with a gap or tie it at the back. If you would like to change your classical trench coat belt to a statement one, choose belts with crystals, spikes or any shiny details. For a chic look, button up your trench coat and belt up to show off your silhouette. Best if you pair up with high heels, to emphasis the feminine and business chic look. Great for an evening wear out as well. Button up trench coats would be suitable with turtle neck tees and dresses as well! It will nicely emphasis your neck and detail of your look. For more street style vibes, roll up your sleeves. Great way to emphasis your t-shirt sleeve details, jeweleries or your watch. 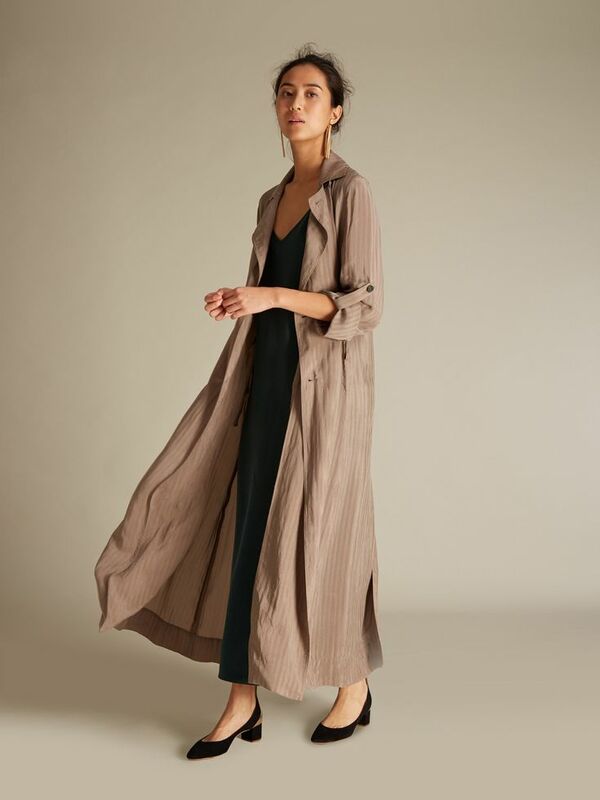 Long trench coats are great matching with long maxi dresses, skirts or leather pants. Be aware to choose the right length of trench coat depending on your height though.